About: I am a retired Registered Nurse from New Orleans La. relocated further west since Katrina to a tiny town in the country. 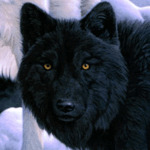 Interests: I have wolf/dogs and they have been my passion for over 12yrs. I also love to refinish antiques and collect art.